I am in Greece, swimming and looking. And painting, even if a little slowly because of the heat. A Swedish watercolourist told me how he comes here twice a year, in spring and autumn. He hires a bike, rents a place, packs his studio in his backpack, and spends each day in a new place painting. After five weeks or so, he returns to his family. The results made a fine exhibition in the old school here. My studio is not quite that portable, but the basics fit in my suitcase: some canvas panels and pads of paper, a small sketchbook, a selection of brushes, and a palette of colours warm and cold in tubes of acrylic and watercolours. Once I arrive, I cut up water bottles to make pots for water and brushes. The local supermarket provides plates for mixing, and a trip to the rubbish bins often offers cardboard boxes in a selection of sizes which I cut up for big paintings. This year I have also bought locally foil trays with lids, sponge cloths and baking paper. From these I make a wet palette that keeps acrylics working for days (especially if kept in the fridge when not in use). The looking provides a portable store of colours and images to take home, and that may emerge later in the year. 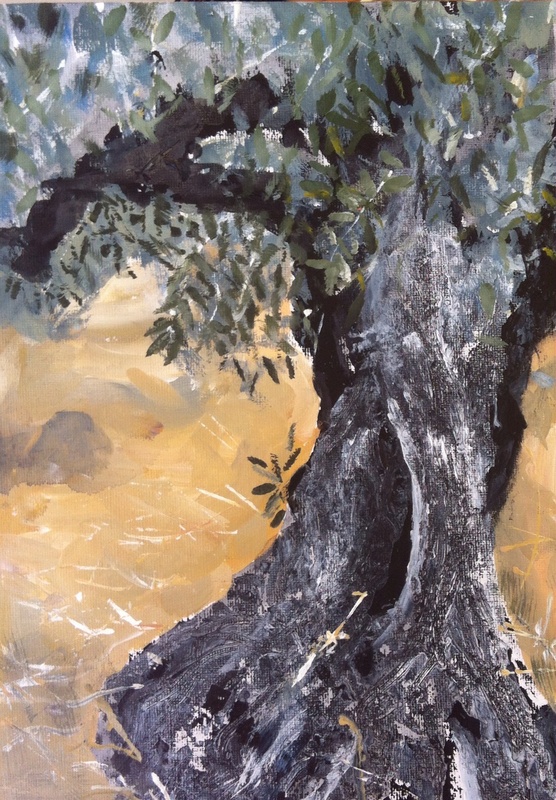 And as always, the olive trees beg to be painted.